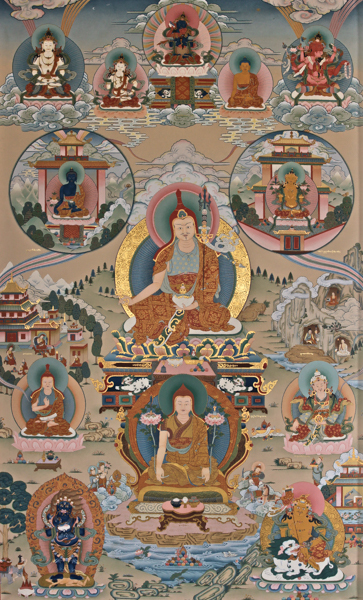 The first system, that of the Early Translation School, or Nyingma, consists of the “three yogas.” The first of these three sections is that of the Mahayoga approach. This section includes The Concise Path by Buddhaguhya; the precious master Padmakara’s Pith Instructions: The Garland of Views, together with a commentary, and his Sphere of the Mamos’ Activity; and the concise instructions on The Heart Essence of Secrets by the omniscient Longchenpa. The Anuyoga section includes teachings on the four stages of yoga connected with The Clarification of Bliss, and extracts from the intuitive techniques of meditation from the Discourse of United Intent. Of the three categories—outer, inner, and secret—of the Atiyoga section, the outer Category of Mind surveys the fundamental tantra and explanatory commentaries, and includes the empowerment for The Eighteen Meanings of A and the instructions from the tradition of Kham, Nyang, and Aro. The inner Category of Expanse surveys the fundamental tantra and explanatory commentaries, and includes meditation methods, the blessing ritual of the guru, and instructions. The secret Category of Direct Transmission surveys the fundamental tantra and explanatory commentaries, and includes the empowerment and instruction for the Innermost Heart Drop of the Guru; the secret cycles of the omniscient master of the Buddhist teachings, Longchenpa, including his instructions for the cycle of Being at Ease in Mind Itself and The Trilogy of Natural Freedom, his instructions on the tantra Dredging the Pit of Cyclic Existence; and the rituals to honor the gurus of the Heart Drop lineage and to make offerings to the seven classes of guardian deities of these teachings. Source: Richard Barron, The Catalog of the Treasury of Precious Instructions, pp. xv-xvi. ↑ The meaning of this analogy is that the real point of spiritual practice is the attainment of supreme enlightenment; all other spiritual attainments, however impressive, are secondary and simply result without having to be sought as specific goals. In fact, to practice solely in order to gain these other attainments constitutes an error in motivation that will lead to spiritual pride and the potential misuse of such attainments. ↑ [[Wylie:|Barron, R.|Barron]], The Catalog, page 199, note 91: As Kongtrul notes below in his discussion of the lineages through which the teachings in The Treasury of Precious Instructions were transmitted, this text was to have been included at the behest of his guru, Jamyang Khyentse Wangpo, but the text was unavailable. There is a reference in the Blue Annals, 159, to a master of the anuyoga lineage named Dewa Saldze. The expanded version of the Nyingma Kama collection (rNying ma bka' ma shin tu rgyas pa), published in 120 volumes in 1999 by Khenpo Jamyang of Katok Monastery, contains a mahāyoga text attributed to “master Durtrö Dewa Saldze”: dPe chung rang gnas, vol. 51 (Zhu) pp. 125–44. ↑ Barron, The Catalog, pp 199, Footnote 96: rDzogs pa chen po sems sde spyi’i snying po’i bstan bcos byang chub sems bsgom pa rdo la gser zhun, vol. 1, pp. 181–90. These first three titles are collected under one title (rDzogs pa chen po’i sems sde’i rgyud lung gi rtsa ba gces par btus pa rnams), vol. 1, pp. 163–90. This text has also been translated by Namkhai Norbu and Kennard Lipman as Primordial Experience: An Introduction to rDzogs-chen Meditation (Boston: Shambhala Publications, 2001). ↑ Barron, The Catalog, pp 200, Note 109: Chenga Chökyi Drakpa, also known as Chödrak Yeshe, was the fourth Zhamar incarnation of the Karma Kagyu school. This title includes a short appended text, the lineage of which Kongtrul mentions below—that is, a supplication to the lineage of the Vajra Bridge cycle of the Category of Expanse, by Minling Terchen Gyurme Dorje. As well, Kongtrul’s catalog omits mention of a final text in the section on the Category of Expanse, that is, Ocean of Timeless Awareness, a clear arrangement of yoga of four spiritual practices and the activity ritual for Ngönzok Gyalpo, from the Vajra Bridge cycle of the Category of Expanse (kLong sde rdo rje zam pa las / nyams len bzhi’i rnal ’byor dang he ru ka mngon rdzogs rgyal po’i phrin las gsal bar bkod pa ye shes rgya mtsho), vol. 1, pp. 441–77; the lineage of this text is discussed later in the catalog. ↑ Barron, The Catalog, pp 201, Note 121: Maṇḍal 'bul ba'i cho ga tshogs gnyis sprin tshogs. Although Kongtrul lists this text in the catalog, the text itself is not included in either the 1981 Paro edition or the 1999 Shechen Publications edition. It is found in the Innermost Drop of the Guru cycle (bLa ma yang tig, vol. 1 (E), pp. 106–66). ↑ Kongtrul's Catalog has this and the next text listed in reverse to what actually appears in the printed edition (Barron, The Catalog, pp 201, Note 124). ↑ Barron, The Catalog, pp 201, Note 133: That is, Padmākara. Pad lugs mkha’ ’gro yang tig khrid yig rin chen gser phreng. This work by Longchen Rapjam is found in volume 1 (Oṃ), pp. 322–94, of the Mkha’ ’gro yang tig collection. It is not contained in the available editions of The Treasury of Precious Instructions. Instead, both editions contain at this point a text by Padmākara entitled Phyi chos mdo sngags thun ming gi lam rim rin chen spungs pa, vol. 2, pp. 257–83. ↑ Barron, The Catalog, pp 201, Note 134: An additional text, not mentioned in the catalog, is included in both editions of The Treasury of Precious Instructions: Sems nyid rang grol gyi gsol ’debs, vol. 2, pp. 371–74. This page was last edited on 28 January 2019, at 21:45.